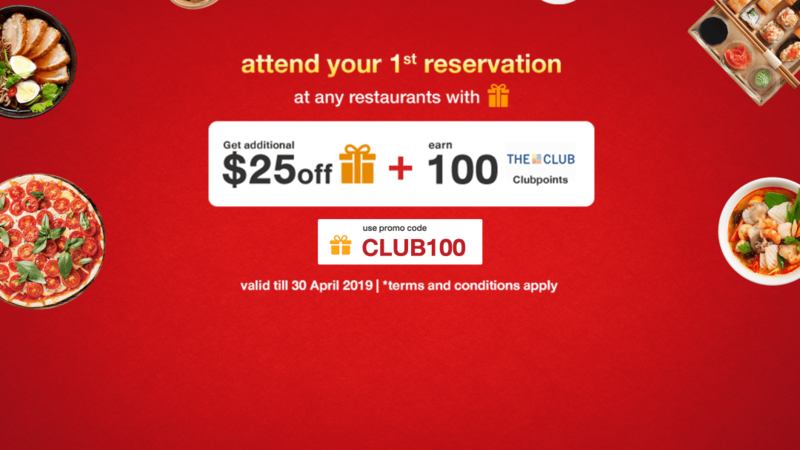 From now till 31 March 2019, upon single spending of HK$500 or above on dining merchants in Hong Kong, you can find a promotion code of HK$50 eatigo cash voucher on relevant transaction appeared in DBS Omni timeline. 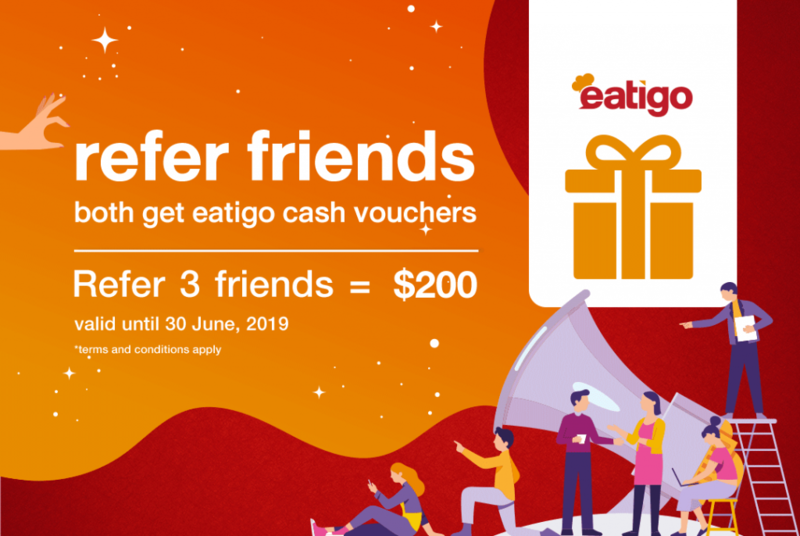 How to get HK$50 eatigo cash voucher? 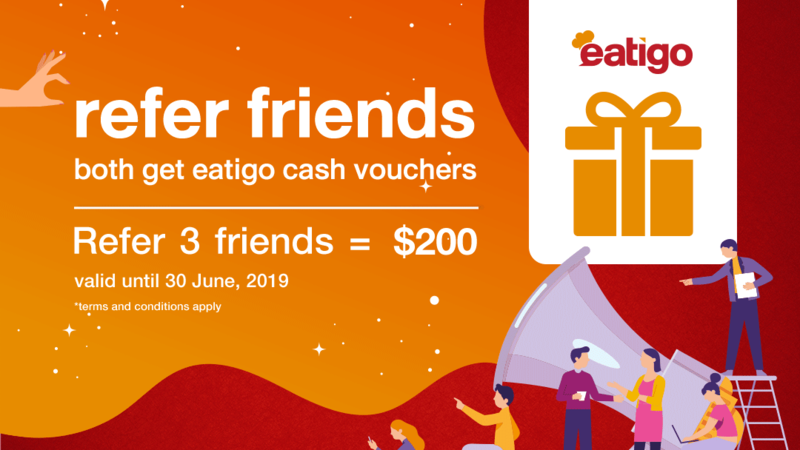 How to use eatigo cash voucher? Offer is limited to 2,000 quota and will be served in first come first served basis. 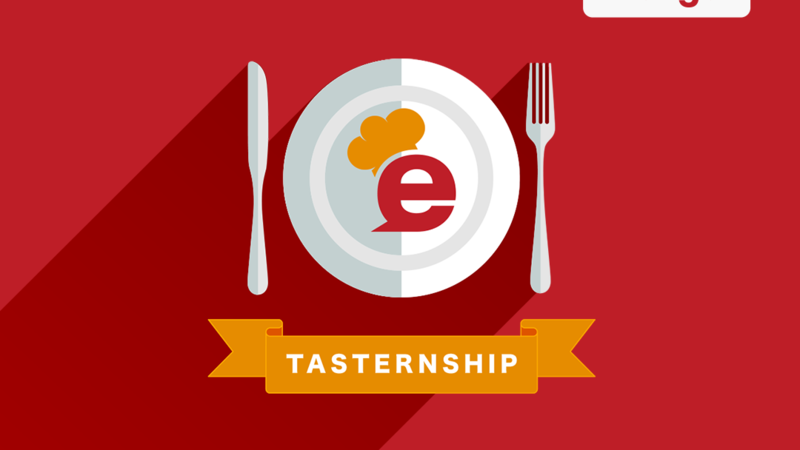 The $50 eatigo cash voucher reward is applicable to a minimum of 2 persons per reservation. When using the voucher, cardholder must attend the booking and settle payment with Applicable DBS Credit Card by 31 August 2019 23:59. Each DBS cardholder and Omni user can only enjoy the offer once. Only one promotional code can be used per reservation. Terms and Conditions apply. For details, please contact eatigo customer services: support.hk@eatigo.com. Not yet a DBS Cardholder? 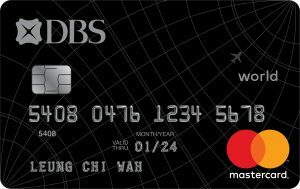 Apply now via DBS Omni and enjoy more exclusive rewards! 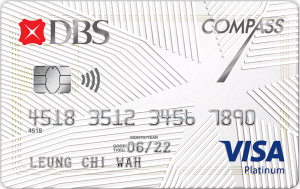 1.Unless otherwise specified, “eatigo HK$50 Cash Voucher” (“Promotion”) is only applicable to the cardholders (“Cardholders”) of DBS Credit Card, its Co-branded Cards and DBS COMPASS VISA (excluding Private Label Card and Business Card) (“Applicable Credit Cards”) issued by DBS Bank (Hong Kong) Limited (the “Bank”). 2.The “Promotion Period” runs from 12 February 2019 to 31 March 2019, both dates inclusive. 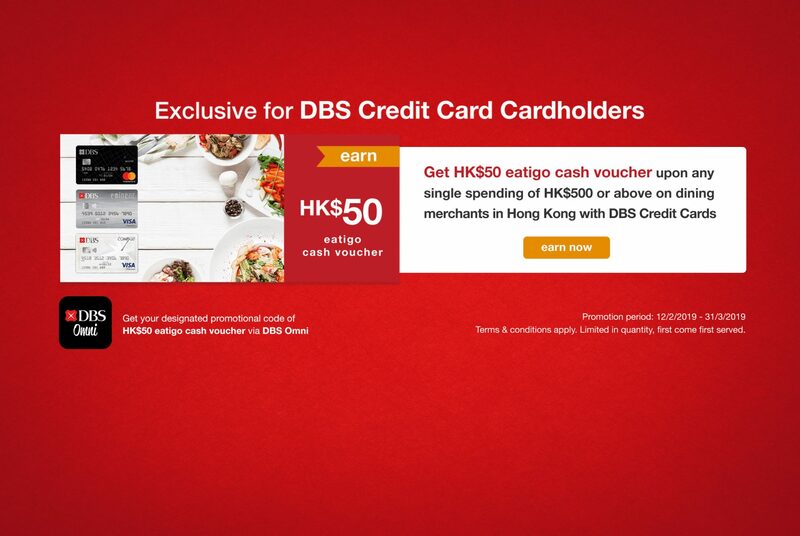 Upon single spending of HK$500 or above on dining merchants in Hong Kong (“Eligible Transactions”), Cardholders can find a promotion code of HK$50 eatigo cash voucher (“Offer”) on relevant transaction appeared in DBS Omni timeline. 4.For the purpose of the Promotion, the following types of transactions should not fall under the scope of Eligible Transactions: any transactions that are subject to cancellation, charge-back, return of goods and/or refund, or any other categories of transactions as the Bank may specify from time to time. 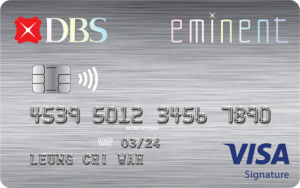 5.To be eligible to enjoy offer, Principal Cardholders of Applicable Credit Cards are required to install the DBS Omni mobile application and completely register an DBS Omni account on or beforeconducting Eligible Transactions , and turn on the notification in DBS Omni setting > Push Notification for participating in the Promotion. 6.Offer is limited to 2,000 quotas and will be served in first come first served basis according to the successfully redemption on Participating Merchant’s website (eatigo.com) and mobile application (“eatigo App”) in Hong Kong. 7.Each DBS Omni user can enjoy the Offer once only. Offer is entitled by Cardholders shall be determined by the Bank at its sole discretion based on the Bank’s record. 8.When cardholder makes reservation at participating merchant, Cardholder must enter the promotion code at the confirmation page during the Promotion Period. (Details: https://bit.ly/2GAYYZK) The Bank and participating merchant will not accept any liability should a Cardholder fail to input the promotion code when settling payment and that it results in forfeiture of the Cardholder’s eligibility to the Offer. 9.A minimum of 2 persons is required for each reservation. Cardholder must attend the booking and settle payment with Applicable Credit Cards by 31 August 2019 23:59 (Hong Kong Time); otherwise, it is considered to give up offer on its own. 10.If the Applicable Credit Cards is not accepted by the restaurant, the bill will not be eligible for the Offer and no retroactive claim will be permitted. 11.Only one promotion code can be used per reservation. Offer cannot be exchanged for cash and can only be used as a fixed value discount on top of the total reservation bill after eatigo standard discount. 12.Offer will be forfeited for reservations marked as a no-show. 13.Offer can only be used at the participating restaurant s which will accept the usage of eatigo cash voucher ( marked with the yellow gift box). 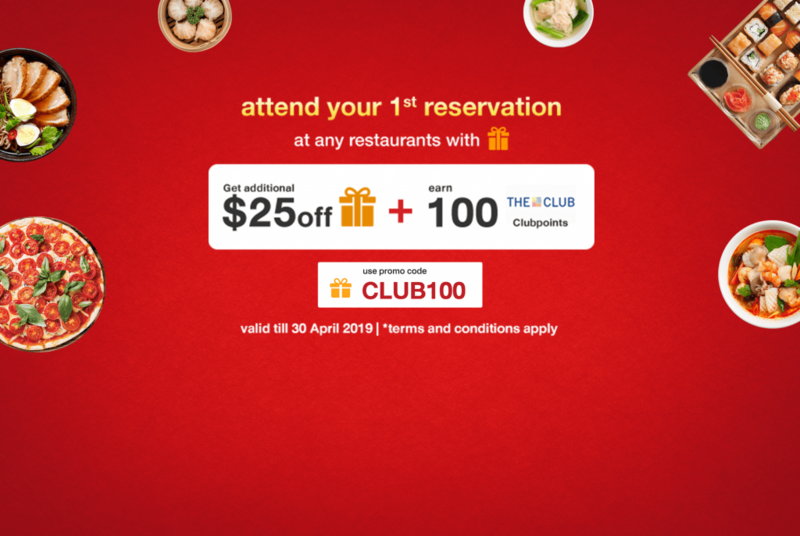 Restaurants without the yellow gift box will not be applicable for the Promotion. 14.Restaurants will not provide cash refunds when the eatigo cash voucher/ promotion code amount is more than the restaurant bill. 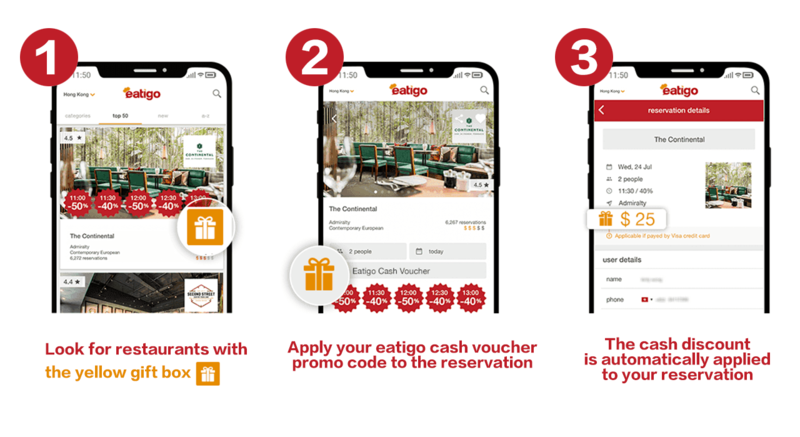 15.Similar to the standard eatigo discount, eatigo cash voucher/ promo code cannot be used in conjunction with any other restaurant promotions or third party promotions. 16.Offer is valid only for usage on eatigo website (eatigo.com) and mobile application (eatigo App) in Hong Kong only. 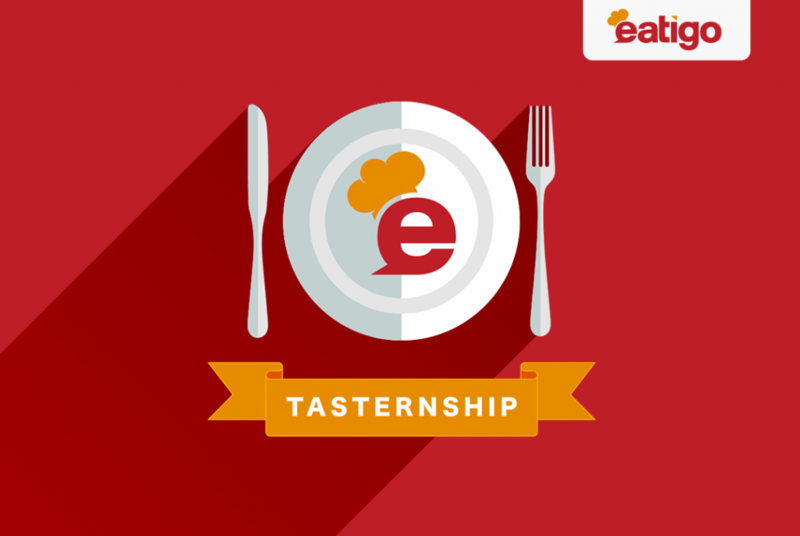 17.Terms and Conditions apply on using coupon at eatigo. For details, please contact eatigo customer services: support.hk@eatigo.com. 18.Time and validity of any transactions and/or eligibility of a Cardholder to the offers shall be determined by the Bank at its sole discretion based on the Bank’s record. If there is any discrepancy between the record of transaction held by a Cardholder and that held by the Bank, the Bank’s record shall be conclusive and binding on the Cardholder. 19.Participation in the Promotion is subject to there being no abuse/noncompliance by the Cardholder, failing which the Bank will debit the values of the Offers from the Cardholder ’s account without notice and/or take such action to recover any outstanding amounts. 20.A person who is not a party to these terms and conditions may not enforce any of their terms under the Contracts (Rights of Third Parties) Ordinance (Cap 623 of the Laws of Hong Kong). 21.The Bank and participating merchants reserve the right to amend these Terms and Conditions as well as to vary or terminate the Promotion. In the event of disputes, the decision of the Bank and participating merchants shall be final and binding. 22.The English version shall prevail if there is any inconsistency between the English and Chinese versions.